Confederation CHQ has decided to publish a book on Com Vyasji, who had been the Secretary General & President of Confederation for about 45 years. 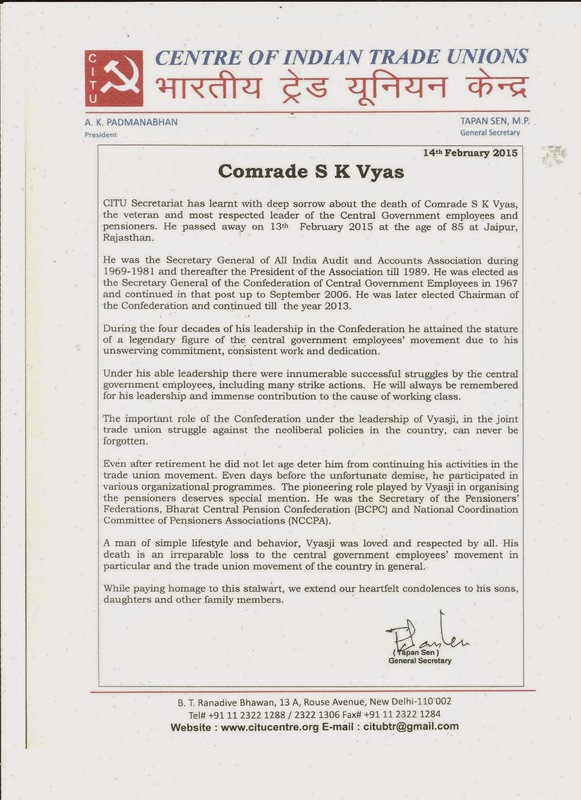 Interested leaders and other comrades are requested to send their BRIEF WRITE-UPS ON THE RARE AND SPECIAL INCIDENTS/ MOMENTS EXPERIENCED BY THEM IN CONNECTION WITH COM: VYASJI'S TRADE UNION LIFE. Photographs of Com. Vyasji, which deserves special attention, may also be sent. All write-ups and photos should reach Confederation CHQ (1st Floor, North Avenue Post Office, New Delhi- 110001) on or before 31st March 2015. All are requested to send by EMAIL ALSO (confederationhq@gmail.com OR mkrishnan6854@gmail.com). Please read the circular No. NC-JCM/2015/S.C dated 28.02.2015 of JCM National Council Staff Side regarding discussion with 7th CPC exhibited in Confederation website. Please furnish the following information immediately by e-mail (confederationhq@gmail.com OR mkrishnan6854@gmail.com). 1. Name of the organization which has submitted its memorandum to CPC with date of submission. 4. The number of employees, whom the organization represents. 5. The total – Group ‘C’ and Group ‘B’ Non Gazetted – strength of the concerned Department. Information should reach Confederation Head Quarters on or before 2nd March 2015. Meeting with Chairman 7th Pay Commission & Discussion with Govt. 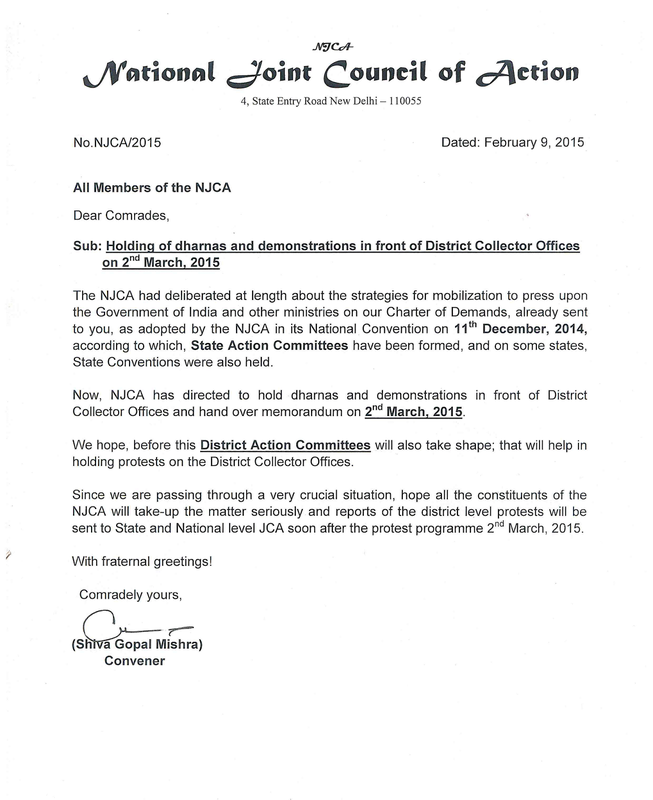 on NJCA Strike Charter of Demands - 25.02.2015 - Com. K. K. N. Kutty (President), Com. M. S. Raja (Working President) & Com. M. Krishnan (Secretary General) attended both the meetings on behalf of Confederation. Com. M. Krishnan, Secretary General, Confederation of Central Govt. Employees & Workers and Ex-Secretary General, NFPE is elected to the Directive Committee of the Trade Union International (Public Services) which is a part of World Federation of Trade Unions (WFTU) in the international Congress held at Kathmandu (Nepal) on 13th & 14th February 2015. Full report of the International Congress will be published shortly. A delegation of six comrades including Com. K. K. N. Kutty (President, Confederation), Com M. S. Raja ( SG, Audit & Accounts Association), Com. K. P. Rajagopal (SG, ITEF), Com. R. N. Parashar (SG, NFPE), Com. Vrigu Bhattacharjee (Civil Accounts Employees Association) & Com. M. Krishnan attended the Congress representing Confederation. (a) State level joint conventions, wherever, it is not yet held, should be completed without any further delay. (b) On 2nd March 2015 Dharnas and Demonstrations should be held in front of all District Collector offices and hand over memorandum to the collector. (draft memorandum will be exhibited in website) District level Action Committees may also be formed to spear head the agitational programmes. (c) Massive rallies should be held between 23.03.2015 to 11.04.2015 at every state capital of India and memorandum will be submitted to Governer of every state. 3. In the Parliament March on 28.04.2015 each organisation should ensure maximum participation of their members. 4. Press conferences may be held at all levels and Posters, leaflets printed and circulated widely. Com. S. K. Vyas Ji, the legendary leader of Central Government employees and Pensioners is no more. He passed away at about 08:20 PM on 13th February 2015 at a Jaipur (Rajasthan) hospital, where he was admitted a few days back after a massive heart attack. He was recovering, but all of a sudden, the situation worsened and he passed away. He was 85 years. His funeral took place at Jodhpur, his native place, on 14th February 2015. Com. Vyasji was the friend, Philosopher, guide and everything for the Central Government employees movement. In the more than six decades long trade union life, Com. Vyasji endeared himself to every section of the Central Government employees. His death is an irreparable and irreplaceable loss to us. He was a great leader, symbol of simplicity, a gem of a person and a leader who is down to earth. Extremely polite, kind hearted and compassionate. One of the finest human being, tallest leader, a gentle mentor and a legend. The National Secretariat of the Confederation bows its head down before the memory of the legendary leader and dips our flag paying tearful tribute to this valiat fighter of the Trade Union movement. While paying homage to this stalwart, we extend our heartfelt condolences to his bereaved family members and also to the entire Central Government employees fraternity. As already decided by the 11th December 2014 Delhi National Convention of the JCM National Council staff side organisations, intensive campaign and preperations are going on in full swing all over India to make the proposed Parliament March of April 28th and the indefinite strike a historic success. 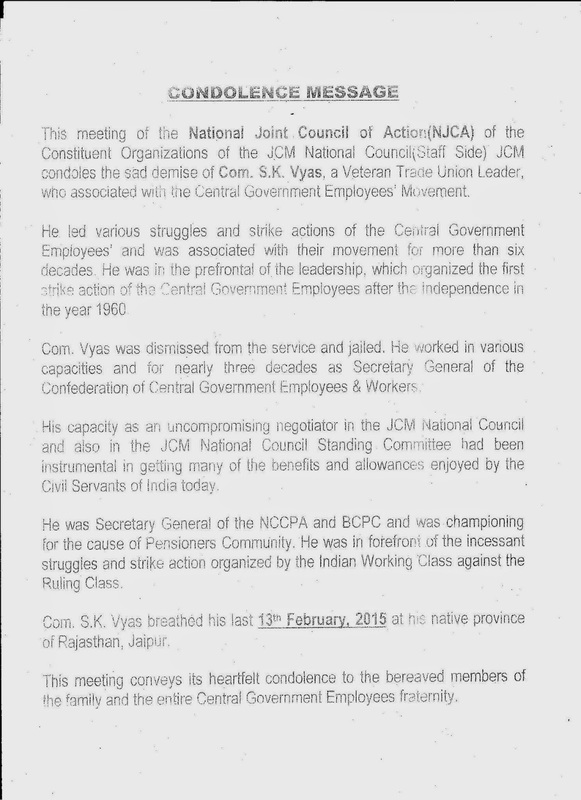 The meeting of the National Joint Council of Action (NJCA) held at New Delhi on 16.02.2015 reviewed the preperations and took the following decisions. (a) State level joint conventions, wherever it is not yet held, should be completed without any further delay. (b) On 2nd March 2015 dharnas and demonstrations should be held in front of all District Collector offices and hand over memorandum to the collector. (Draft Memorandum will be exhibited in website. District level Action Committees may also be formed to spearhead the agitational programmes. 3. In the Parliament March on 28th April 2015, each organisation should ensure maximum participation of their membership. The extended National Secretariat of the Confederation was held at New Delhi on 17.02.2015 and took the following decisions. 1. In the Parliament March, minimum 30000 employees should participate representing the Confederation. They should participate with banners, flags and play cards of each affiliated orgnanisation of Confederation. THE FOLLOWING QUOTA IS FIXED FOR MAJOR ORGANISATIONS AND STATE LEVEL COCS. All affiliated organisations and COCs should start preperations immediately for ensuring participation of maximum number employees as per quota fixed above, in the Parliament March. COCs and major organisations should fix quota to all the affiliated organistations state-wise. TICKETS SHOULD BE BOOKED WITHOUT ANY DELAY. From Delhi and all surrounding states special vehicles should be booked well in advance. Each organisation/COC should make advance payment if accommodation to delegates (participants) are required. For arrangements at Delhi, please contact. Please bring banners, flags, play cards etc. in large numbers. 2. The National Secretariat decided to conduct two days Women’s Workshop at Hyderabad in the month of September 2015. The COC Andhra/Telangana state has agreed to host the two-days camp. Delegate fee will be decided later. Maximum 150 lady delegates from all states will participate in the workshop. Number of lady delegates of Andhra/Telangana can be decided by the COC separately. Affiliated organsiations, COCs and Women’s committee members of confederation should start the preliminary work to ensure maximum participation of lady comrades in the two days workshop. Quota for each organizations/COC, delegate fee, dates and venue of the workshop etc will be intimated separately. 3. National Secretariat decided to call upon all affiliated organisations and COCs to observe 2015 March 8th as “INTERNATIONAL WOMEN’S DAY” in a most befitting manner either separately under the banner of Confederation or jointly with other women organizations. The theme of this year International Women’s Day is – “MAKE IT HAPPEN”. Please take immediate action for successful implementation of the above decisions of NJCA and Confederation National Secretariat. NJCA Circular also enclosed herewith. The meeting of the participating members in the study camp organized by the confederation of Central Government Employees & Workers at Bangalore unanimously resolved to urge the authorities of the Department of Atomic Energy and Indira Gandhi Centre for Atomic Research to revoke the suspension of 4 Office Bearers of NFAEE/AEEA with immediate effect and stop the move to derecognize the Atomic Energy Employees Association resigned under CCS (RSA) Rules 1993. The participants’ notes that the suspension was initiated against these leaders to leading the entire nuclear worker of the Kalpakkam on the attempt of the management is nothing but to suppress the trade union activities at Kalpakkam and the meeting condemn the attitude. The meeting of the participating members extend support and solidarity to the fighting comrades of the Kalpakkam. To express the solidarity with the victimised comrades the meeting has resolved to call upon all organisations attitude to confederation of Central Government Employees and workers, its branches and members throughout the country to held massive demonstration on 18th February 2015 and to pass resolution and send the same to The Secretary Department of Atomic Energy, AnushaletiBhavan, CSM Marg, Mumbai-400001. Condolence meeting on the sad demise of Com. S. K. Vyas Ji will be held at New Delhi on 17.02.2015 at 3 PM. Meeting is organised by Confederation of Central Government Employees & Workers (CHQ) and also Delhi State Unit. 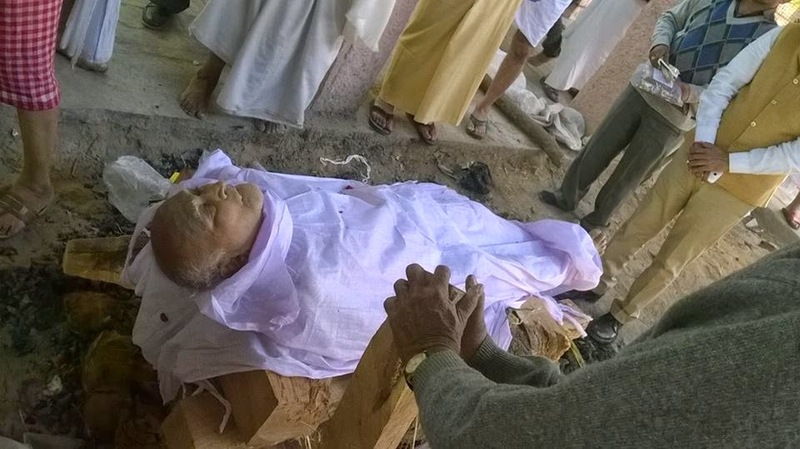 Comrade S.K.Vyas a revolutionary leader of CG Employees for more than fifty years is being laid to permanent rest. His mortal remains being cremated on 14th February, 2015 at Jodhpur. With deep grief and extreme sorrow, it is intimated that Com. S.K.Vyas, the legendary leader of the Central Govt. Employees and Pensioners, is no more. He passed away at about 08.20 PM on 13 February 2015, at a Jaipur hospital, where he was admitted a few days back after a massive heart attack. He was recovering, but all of a sudden, the situation worsened and he passed away. His funeral will take place at Jodhpur on 14th Feb 2015. Com.Vyasji was the Secretary General of the Confederation of Central Govt. Employees and workers since 1967 for more than four decades. He was holding the posts of Secretary General of both BCPC and NCCPA, Federations of Pensioners Associations till his end. His death is an irreparable loss to the entire CGE and Pensioners movement. Our heartfelt condolences to the bereaved family, friends and comrades. 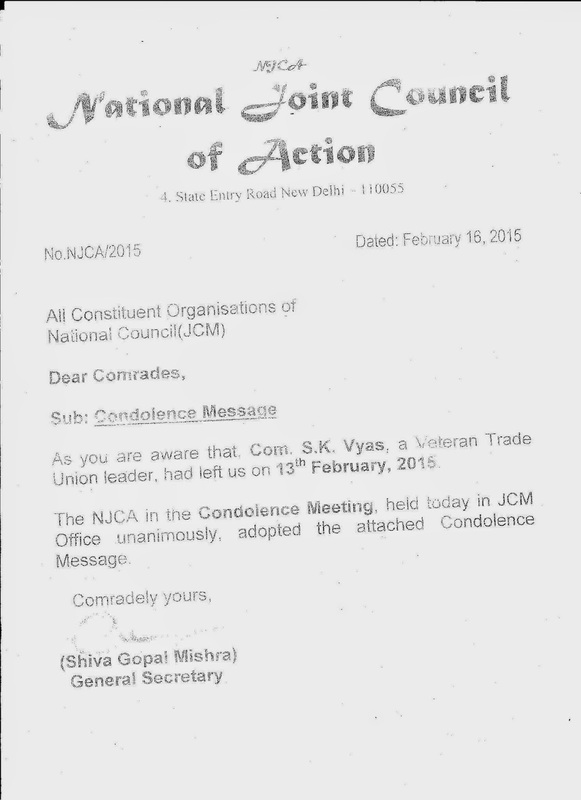 TEARFUL Red Salute to Com.S.K.Vyas ! Com S. K. Vyasji, Veteran Leader of Central Govt. Employees and Advisor Confederation had a massive heart attack and admitted to hospital at Jaipur. Now he is recovering. Confederation National Secretariat wishes him speedy recovery. It is strictly instructed to all NOT TO MAKE ANY PHONE CALL TO HIM OR TO HIS FAMILY MEMBERS. Contact Confederation CHQ for further information. 7. All Ministries / Departments are also requested to furnish an annual return (as on 31st March) in the enclosed proforma to this Department by 30th April every year.